This is the reason why a Samuel K Designer Window is "The Perfect Solution"
Of course you will want to know why would you use a Samuel K Window. You can see it for yourself below. I'm sure you agree that the Samuel K Designer Window looks as good if not better than the Leaded Glass Window which costs more than 5 times the price as the Samuel K Desinger Window. Take a look on how can we transform a simple creation into an asthetic appeal. The glass panels on this shower enclosure have been transformed by replicating the accent moziac on the back walls. This application is the perfect application for privacy and to hide the soap residue. The oval window in this powder room "had a view to and from the street. The Reeds Designer Window provided privacy as well as a great focal point. Clear glass in doors are great, except there is no privacy. These Custom Wilson Designs from Samuel K Designer Window offer maximum privacy and have created a unique upmarket welcome touch to the entrance on this home. The left window is a divided light clear window. After the Samuel K Designer Window was applied we have privacy and a beautiful focal point in the bathroom. This Samuel K Designer Window transforms the view of the neighbors house into an elegant focal point in this bathroom. The shutters in this bathroom created a room that was dark with no asthetic appeal. Once our Samuel K Designer Window was applied the bathroom had a beautiful focal point and became bright and appealing. The before window below was dressed with 3 Woven Wood Shades - not the ideal product in a moist environment. 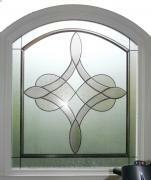 Our Samuel K Designer Window is designed for this application. The window is maintenance free, looks & feels like an expensive decorative glass window and adds great value to the bathroom.